At Polar King International, Inc., designing your own custom, seamless fiberglass walk-in cooler or freezer can be accomplished in three basic steps. The Design Your Own Walk-In tool on the Polar King website allows you to partially or fully customize your own walk-in cooler or freezer. Through 3 simple steps, you select, design, and submit a quote request. Choose from preexisting templates or a blank template to fully customize the layout and additional options. 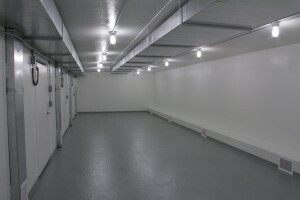 Customization is available in each facet of the walk-in cooler and freezer, from door and wall locations to the type of walk-in you require; cooler, freezer, or dry storage. Polar King International, Inc. offers both freestanding and through-wall units as well as several conjoined walk-in cooler and freezer style units. This easy to use resource offers the added bonus of a 3D render of the final product; view both the overview and a walk-through view of your customized unit. 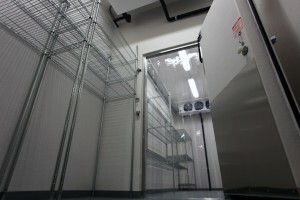 Step one of the Design your own Walk-In allows you to select the style of walk-in unit that best fits your freezer and refrigeration requirements. You can choose from Freestanding or Through-Wall styles of walk-in coolers and freezers; Freestanding is a walk-in unit that is not connected to another building on any side, Through-Wall is a walk-in unit that shares a wall with an existing building. This section allows you to choose from a variety of premade templates to customize, or to choose a blank template for total customization. Additionally, there are several premade cooler and freezer combination templates that allow you to combine refrigeration, freezer, and dry storage needs. Options available for both freestanding and through-wall styles of walk-in units include Cooler/Freezer combos, separate access coolers & freezers, shared access cooler & freezers, and dry storage cooler and freezer combos. 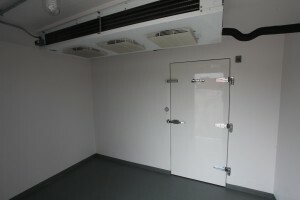 Step 2 of the design your own walk-in allows you to customize several features of your walk-in cooler or freezer unit. Included in this section are the door and wall locations as well as the positioning and opening direction of each door. Additionally in this section, you choose the overall dimensions of your unit, length and width. The “Apply Labels” tool enables labeling of each section of your walk-in unit. 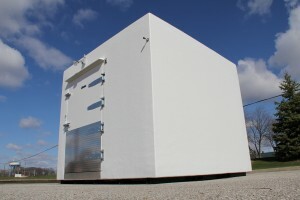 You can choose from a 35°F cooler, 0°F freezer, -10°F freezer, or a dry storage area. After you have completed customizing your walk-in unit cooler or freezer, view a 3D rendering of your unit. This will allow you to view both the outside of the unit and a walk-through view. View 3D Render with both overview and walk-through views. Step 3 of the design you own walk-in requires your basic contact information as well as your anticipated installation date and any further comments on your project. This information is required in order to accurately provide you with a quote. This section also allows you to choose from some additional layout options that can be added to your walk-in cooler or freezer unit. Once finished, you can save your customized walk-in as a .PDF or submit your files and receive a quote bases on your unit. Whether you need a cooler, freezer, or combination, Polar King walk-in units provide the flexibility required in the food-service industry. To find out more about Polar King’s 100% seamless fiberglass design, contact Polar King today!